Birds! All types of birds are incredibly fascinating and have captured our imagination since the earliest times! The world is inhabited with over 9000 species of birds. They are natural wonders of song, color, flight and display. With so many diverse types of birds, learning about them is an exciting adventure. Our list of bird types covers a wide array of avian species from pet birds to exotic birds. Each bird guide offers bird information, starting with where they are found and their background, followed with their habitat, behaviors and bird care. Pictures of birds are provided with each bird guide to help in choosing a pet or aid in bird identification. - Cockatoos... the lovers of the bird world! The friendliest birds, but with an incredible need for attention! - Conure parrots are always playful and full of antics. All types of conures can be noisy, but they are loved for their beauty and good dispositions! - These are very playful birds with with great personalities, and they can be very good talkers! - Lovebirds are delightful little parrots! Found in a rainbow of colors, they love to be playful and mischievous! - All Types of Parakeets are flock birds, very social with each other and with people. They are colorful, active, love attention and make wonderful pets! - Looking for a unique parrot? There are so many different types of parrots... Eclectus, Hawk-Headed, Senegal, Red-Bellied, Parrotlets, Meyers... and more! - Great choice for beginners! Usually quiet, undemanding, affectionate... and they seldom bite! That cooing sound... where is it coming from? It sounds like a dove, but maybe it's a pigeon! 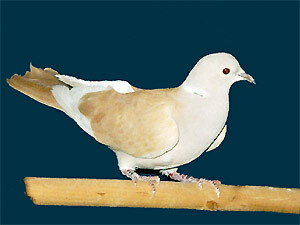 Doves and pigeons are so common, that people often see them. Flocks of large pigeons will be hanging out in parks, shopping malls, and ball fields, always on the look-out for a tasty snack left by a . . .
Animal-World bird guides provide information on large parrots such as amazons and macaws as well as small parrots such as parakeets, lovebirds, finches, canaries, doves and other hard bills and soft bills like toucans. The list of bird types is expanding into water birds, wild birds, birds of prey and more. Pictures of each type of bird are provided within each bird guide. These not only help with bird identification, but aid in choosing pet birds. The bird guides also have in-depth bird information, covering everything from their native place of origin and when first scientifically described, the habitats and behaviors of each species, and the bird care needed to keep them as a pet. Keeping pet birds or exotic birds provides a very personal and rewarding experience. One of the richest experiences you can have is bonding with a pet bird. That moment when you and your bird connect is not only extraordinary, but lasts throughout your relationship. Birds have an incredible memory, and once you've been chosen, you have a friend for life. Bird Care - How to take care of a pet bird. Bird guide with everything you need to know to take care of your pet bird from bird supplies and food, to exercise, safety and bird health care. Choosing A Pet Bird - What is the right bird for me? Learn about pet birds and finding birds for sale.